Right after opening my Christmas presents I am packing my bags to go to France! I am extremely lucky to have a fiancée, originally from France and we left the beauty of the prairies for the beauty of France for a week. I might take a photo or two while I'm there, so keep checking back for a France gallery. Merry Christmas and happy holidays to all my family, friends and clients as well as all of you other blog lookers! 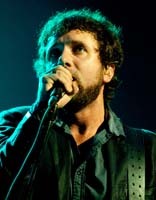 Thanks for a great 2011, I'm looking forward to an amazing 2012 with all of you! My first official job for the 2012 FDV started in 2011 with a photo shoot of the new official family to create photos for the official button and promotional purposes. The family this year is another amazing family, this time with some younger kids who were already keen to be a part of it all! I created the Winnipeg Photo Community over seven years ago and today and since then it's grown exponentially, now with over 3700 registered members. However, we've also had the same rules since the beginning and it's time now for a change. So today, with the help of my moderating team of six people, we spearheaded a major campaign to create a new and improved direction for the community in order to reinvigorate the existing membership and create excitement for new members. 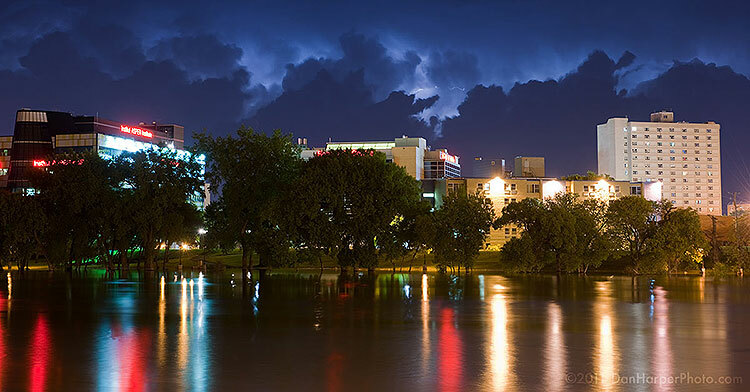 If you get up at 5 in the morning to capture the perfect sunrise, if you get out of bed for lighting storms at 2am, if you can't wait for the perfect snow and if you're as passionate about photography as we are, you should check out the Winnipeg Photo Community! 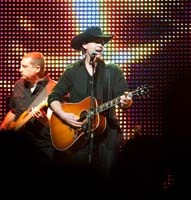 I've finally had time to go back and create galleries for several shows and events from the MTS Centre. Baby photography twice in a week?!?! That's unheard of for me, but it makes a lot more sense when the baby is Dave's, a long time supporter of Dan Harper Photography. 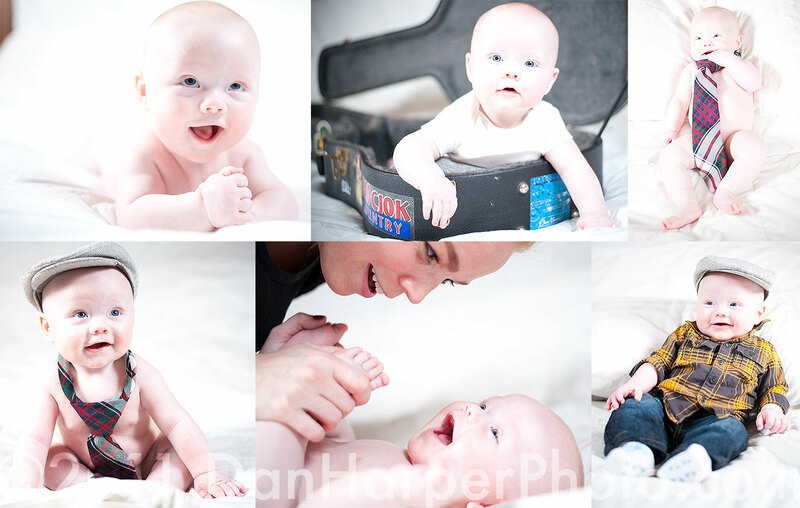 And hey, having a super cute and photogenic baby is just another bonus for me! And hey, now I know what all those babies are looking at... the funny people behind me making weird noises! 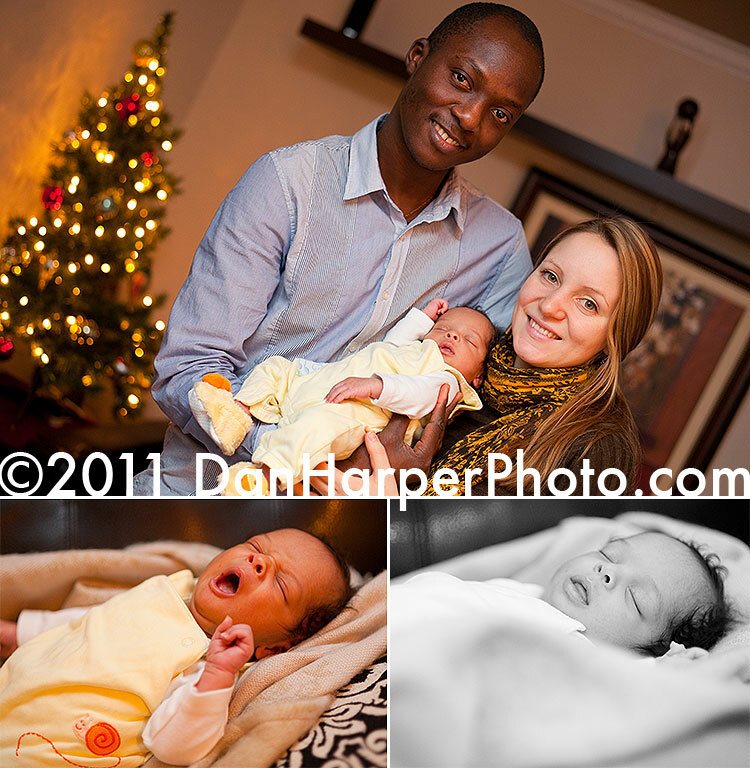 Since I'm normally so busy with corporate assignments I don't normally get a lot of time for family or baby photos but I'm really happy I was able to help Wil and Sophie to get a nice holiday card and to take some photos of their new baby Emmanuel! 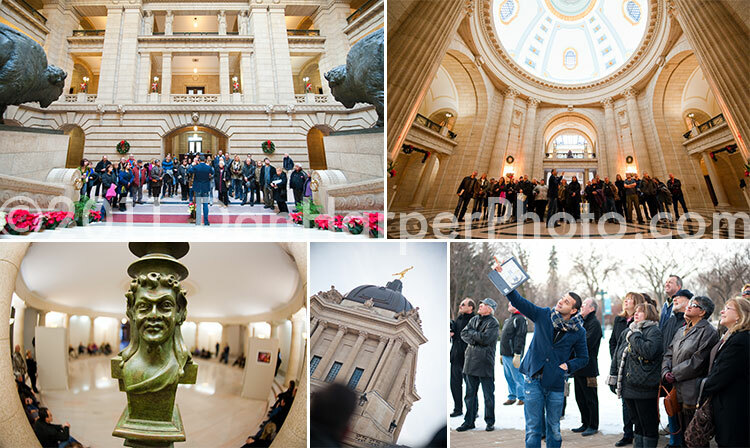 Stock assignment photography: Today I photographed the Hermetic Code Tour at the Winnipeg Legislature. 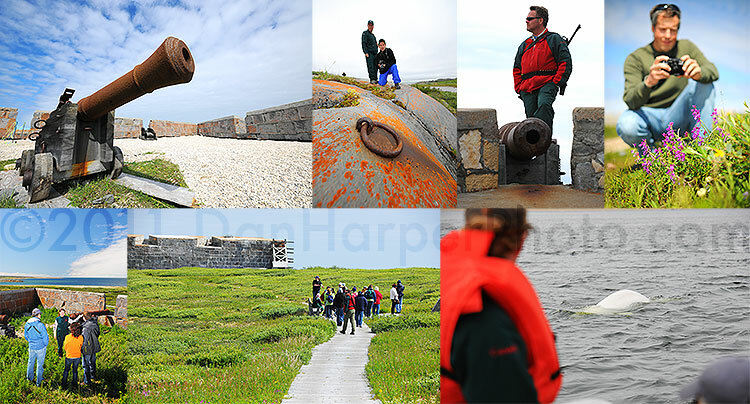 This was a really interesting assignment because I got to follow along with the tour which was extremely interesting. The research that was done to discover details about our own "Lege" was really intriguing. As the official photographer and photography coordinator for events at the MTS Centre, I like to give opportunities to other photographers. Using the Winnipeg Photo Community of which I am president, I post opportunities for budding photographers, in this case Disney on Ice who I chose Tariq to shoot in my stead. I have had an ad on Power97 for several years now and today I was asked for my input on a new ad as well as an add on CJOB! This is not only very nice of the stations to recognize me but it's also great for business as CJOB is the #1 radio station in Winnipeg and Power97 is the #1 station on the FM dial! Huge thanks to all involved especially Lexi! As president of the Winnipeg Photo Community today I organized our annual holiday party at the MTS Centre, where I also had a really exciting "Secret Santa print exchange" which was extremely popular. People brought in up to 10 prints and then exchanged with others. If you're as passionate about photography as I am, you should definitely get into the WPC! As the official photographer and photography coordinator for events at the MTS Centre, today I had Dwayne shoot Gordon Lightfoot in my stead. 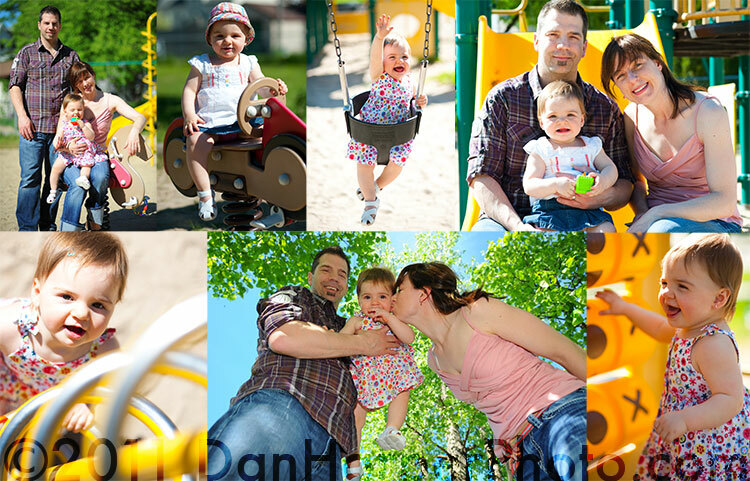 You can get this and other opportunities by joining the Winnipeg Photo Community.. 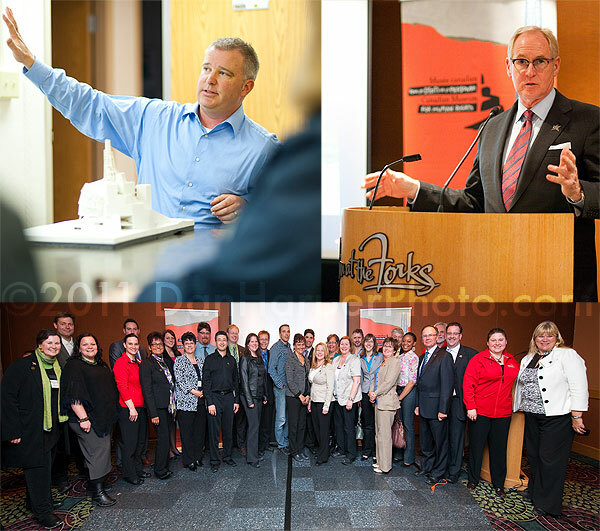 Event photography: Tourism Winnipeg holiday luncheon. Today I brought in my print to participate in a multi-artist show at the WAG. No not that WAG this time, but the equally interesting Wayne Arthur Gallery, where I'll be having my own show later in 2012. 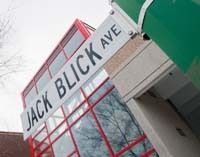 The current show runs for the month of December, go check it out on Provencher! 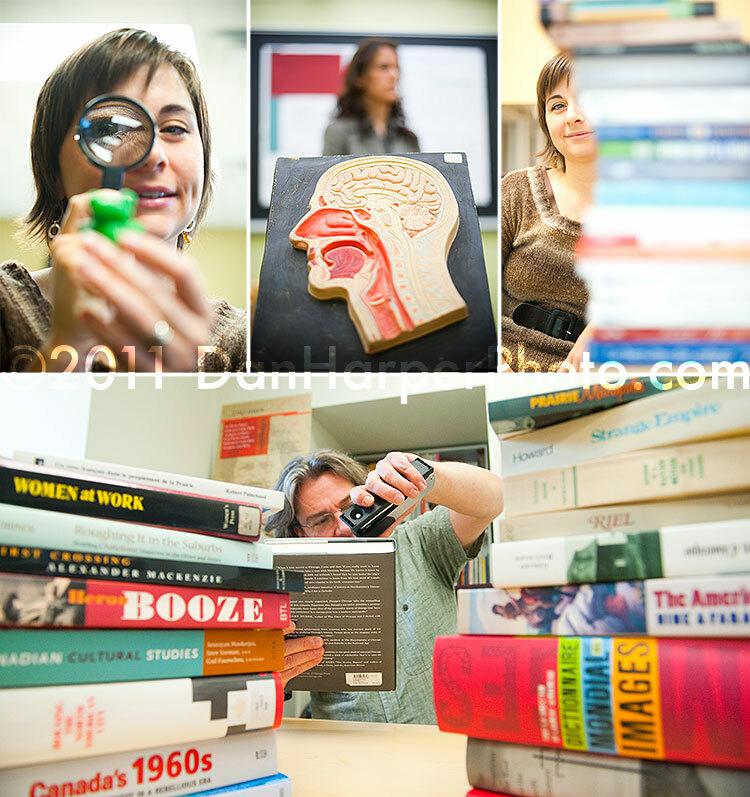 I've finally had some time to get to a backlog of stock photography I've had on hand since the summer. 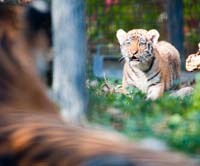 Today I shot not only the grand opening of the Qualico Family Centre at Assiniboine Park but also a video of the zoo's tiger cubs who have grown to be about 3 times the size since I last saw them. 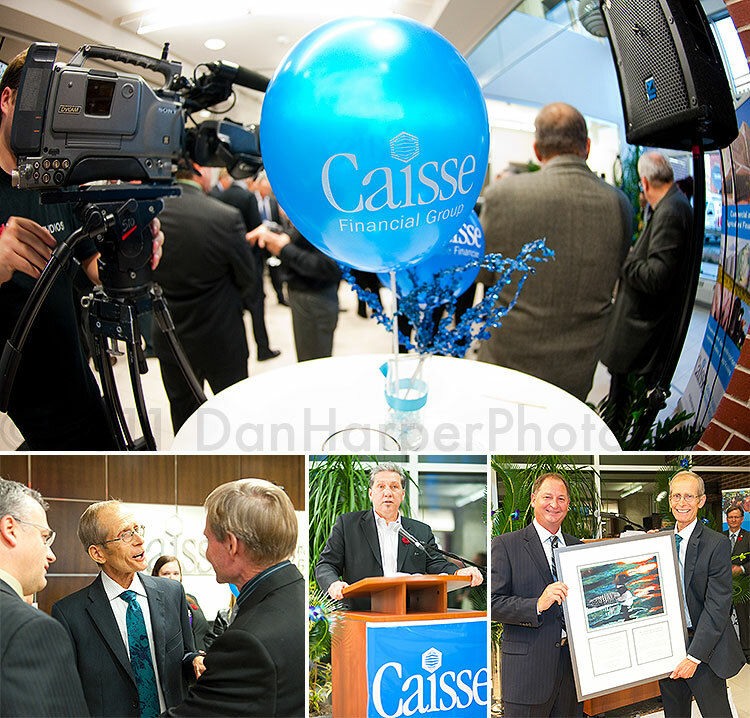 Two weeks ago I was asked by a company from New York to cover a large event in Winnipeg. Up until then I had never heard of "We Day" but obviously I was living under a rock because it was absolutely amazing! 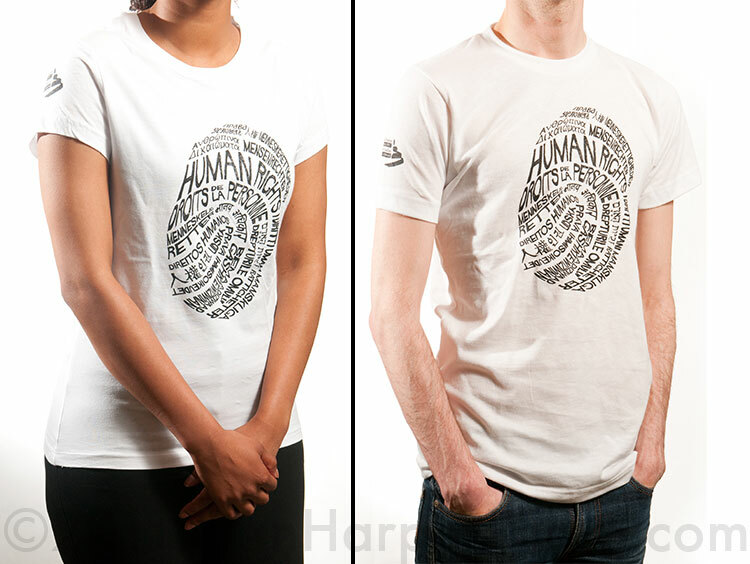 We Day is an event to promote a positive future and empower youth and it sure seemed to work. With names like Paul Martin, Rick Hansen, Al Gore, Shawn Desman, Mia Farrow and Headly add to that 16000 screaming kids and you have yourself a real ball of energy! Today I got word that after submitting my application two weeks ago I was chosen once again to be the official photographer for the Festival du Voyageur for 2011-2012! 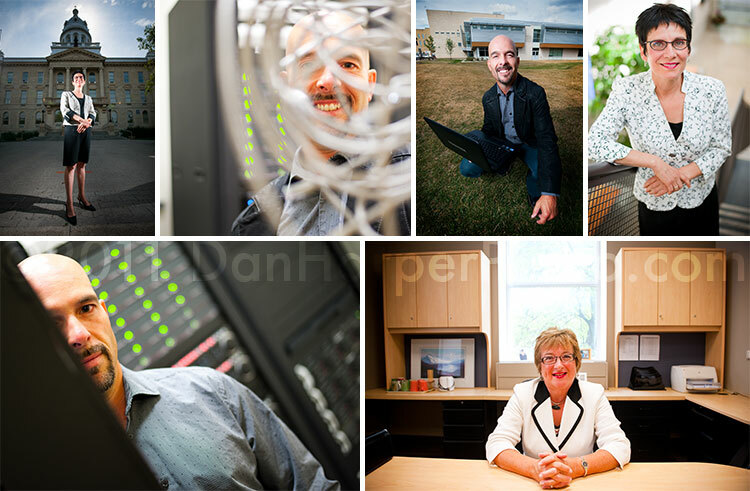 I'm obviously hugely honoured to be chosen again and happy that I've had so much fun in "becoming" a voyageur by wearing a toque beard and strangely coloured shirt ;) not to mention taking some great photos for an amazing client! When I started shooting over 7 y ears ago I did a lot of weddings, dozens of them a year but in the past 3 years I've almost completely stopped doing weddings since I've wanted to make a personal life for myself and that takes a LOT of weekends! However, over the past years I just don't seem to be able to get away from doing at least one a year and this year was for Kris and Lindsay, who I'd shot Kris' friend's wedding Kelly, years back. Kris hounded me for months to shoot his wedding, and I finally caved in and said yes. Tonight I hosted an online chat and critique for the WPC. We had over 20 members in attendance at the same time which breaks our previous record of 17 and there were about 40 people online throughout the evening. 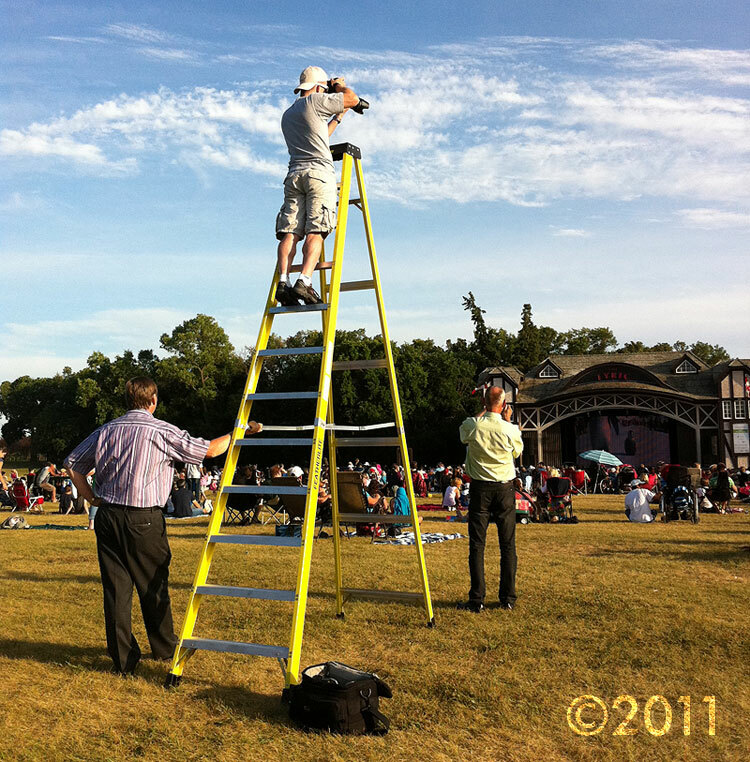 Someone who saw me shooting at the Assiniboine Park a while back submitted this photo of me precariously positioned on a ladder trying to get the best shot! Anniversary photography: This wasn't just any anniversary, it was a photo to commemorate the 75th anniversary of the CBC! This was a HUGE group photo which was later also used on the news. 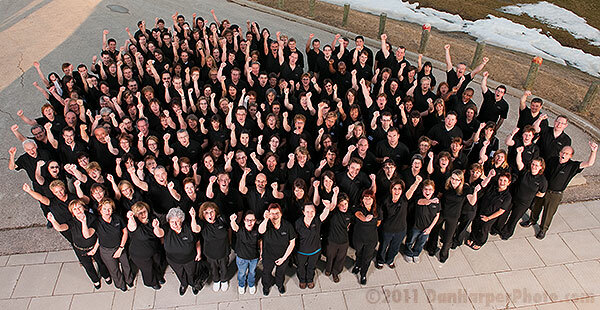 There were 168 people in this photo making it officially the largest group photo I've ever done! Social photography: Dave and Candice's Halloween themed social! There was some major auroral activity this morning so I was all over them! Full gallery to come later. 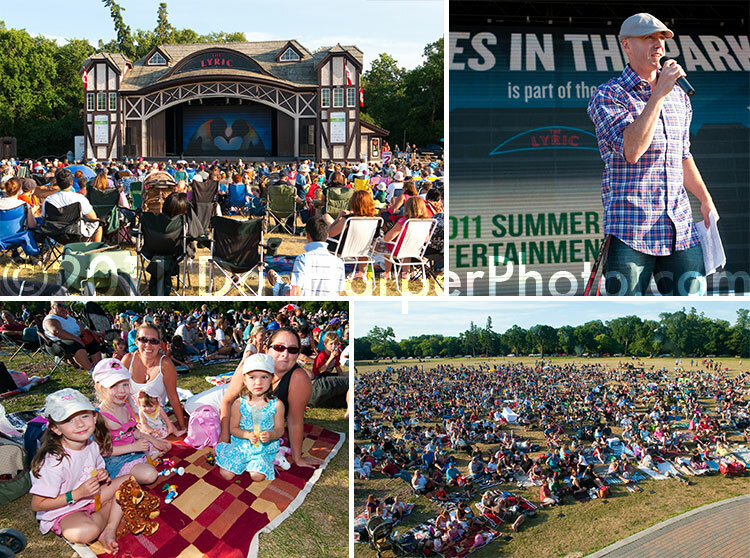 Commercial/advertizing photography for the Assiniboine Park to promote Boo @ the Zoo. 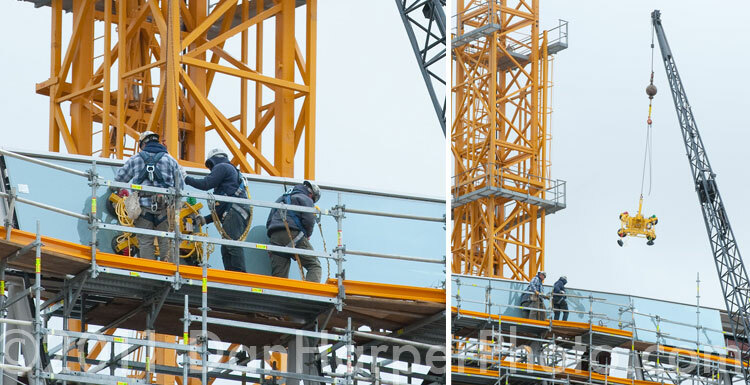 In all honesty this was just a test and isn't the best example of my gigapans but is still neat to see inside the CMHR! Today, fulfilling a promise I made to the photo community to which I am...the caretaker (president, sometimes baby sitter) I put on a free printing workshop at the MTS centre. This workshop was mainly focused on teaching others how to get their photos off their camera and onto the wall including how to print REALLY big photos from any image. The event was a huge success with over 40 people in attendance! Thanks to all who attended. I made a promise to the members of my photo community The WPC and I'm keeping it this week by putting on a free printing workshop, October 18th at the MTS centre, teaching others how to get their photos off their camera and onto the wall including how to print REALLY big photos from any image. If you want to participate or want to get involved with the WPC, it is a free community I created over 7 years ago and still maintain on a volunteer basis. 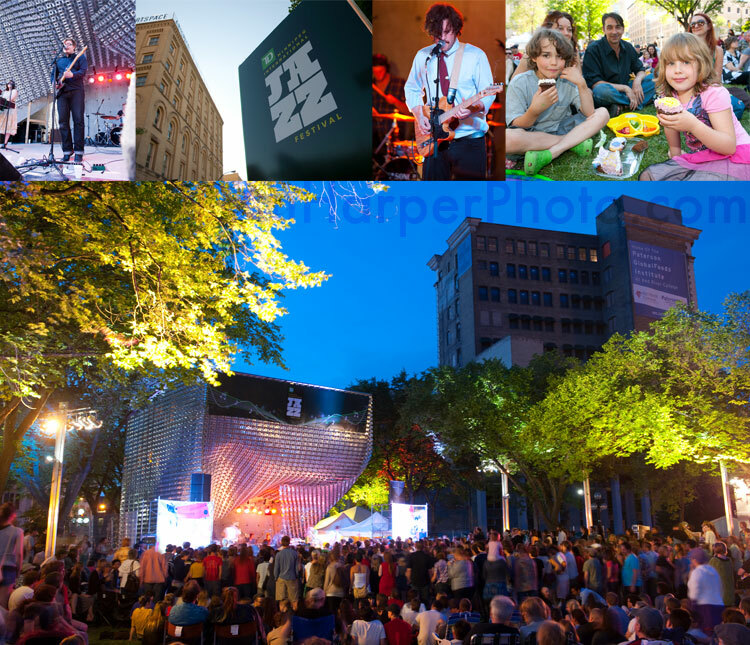 If you're into photography and want to enhance your skills you should definitely check out: The Winnipeg Photo Community! 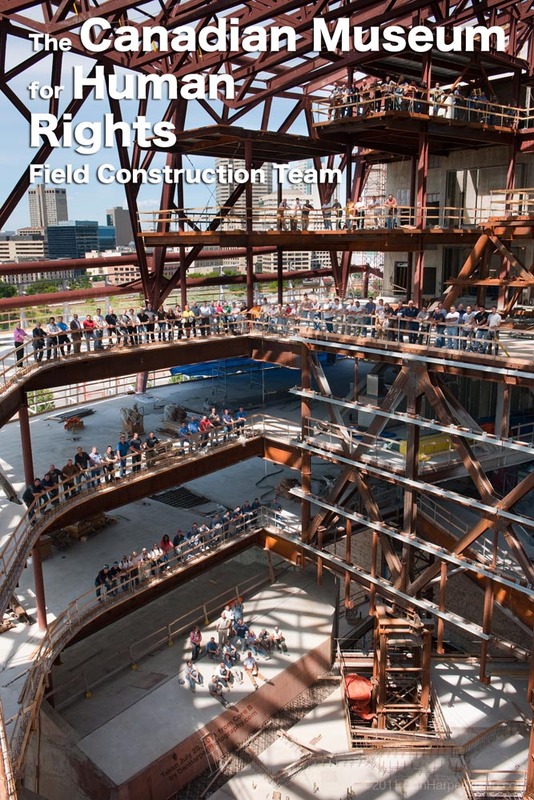 Today I sold another stock photo of the CMHR to PCL shot from one of my helicopter charters this summer. Today I had the pleasure of working with almost 50 employees from E&Y. Although I only got to spend a very few minutes with most of them, you can tell this is the type of office environment you'd want to work in as everyone was happy, even before having their morning coffee! As the photography coordinator for the MTS Centre, have been trying to open up opportunities for other photographers for them to get more experience so I offered the opportunity to photograph Rise Against to photographers on my photo community, the WPC and out of the handful of people who applied I chose Dwayne to shoot it for me. Thanks Dwayne! Thanks to Kevin for the opportunity! 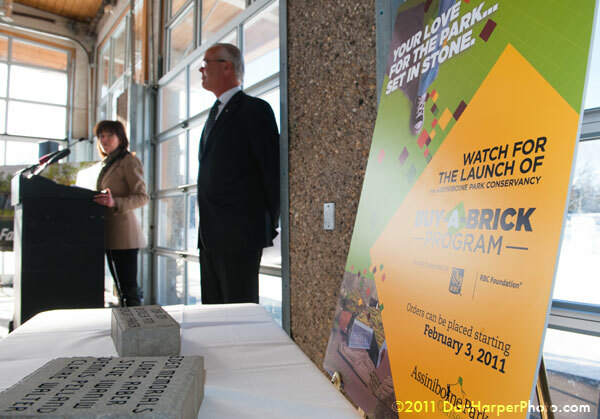 An amazing visionary event hosted in Winnipeg in 2010 (of which I was the official photographer for) will resurface in 2012. This is an international business to business event over three days that will happen again in 2012. Great for the Winnipeg economy! 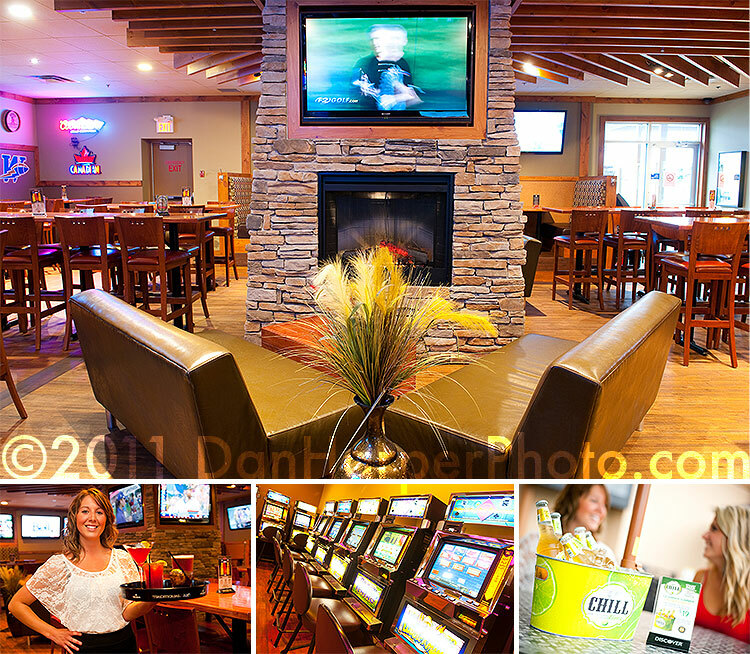 Advertising photography for TV: My photos were featured in a TV ad bumper for Taps Pub. You can see the ad here(or click below) don't blink or you'll miss them! Photos related to this entry were also seen in the August 16th BLOG post. 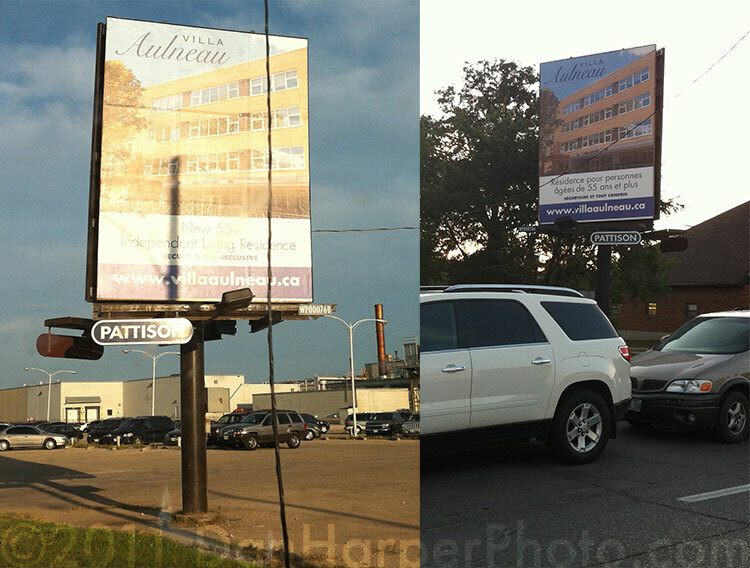 Today while driving around town I saw my photo on not one but two electric billboards, both at 201 Portage as well as on the Convention Centre's. This ad was originally slated as a bus ad but I'm happy to see it was upgraded! 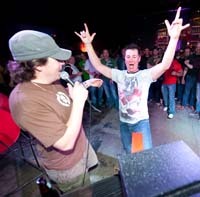 For this event I was also asked to shoot the meet and greet and was able to bring some friends in to meet the band. As regional director for Marathon-Photos.com I was in charge of hiring 2 photographers to photograph this event. Over the period of a year I normally have a minimum of a handful of events for which I hire about 30 people in total. I do not shoot weddings. Three years ago I stopped taking weddings in order to concentrate more on my commercial photography as well as to give myself a bit more time to have a life (I guess it worked since I just got engaged). However, Kris kept calling me and calling me and wouldn't take no for an answer and after he took one of my ideas for his wedding and then drove a dump truck full of money up to my front door, I caved in and accepted. Huge thanks to Kris and Lindsay for all of their great smiles and accommodation! You're great people and I know you'll have a great life together. Gear testing: Today I bought a new piece of kit, a variable ND filter so I went out and tested it. If you want to see results from this and other gear please see my articles page. This session was for two reasons: photos of USB staff that would be featured in the USB newsletter and also portraits of USB president (and best dressed) Raymonde G.
Web site creation: In another life (about 8 years ago) I used to design and create web sites. After a new client asked me to do the photography for his new product: Foxwalls, he also convinced me to dust off my web site machine and make him a site for Foxwalls. 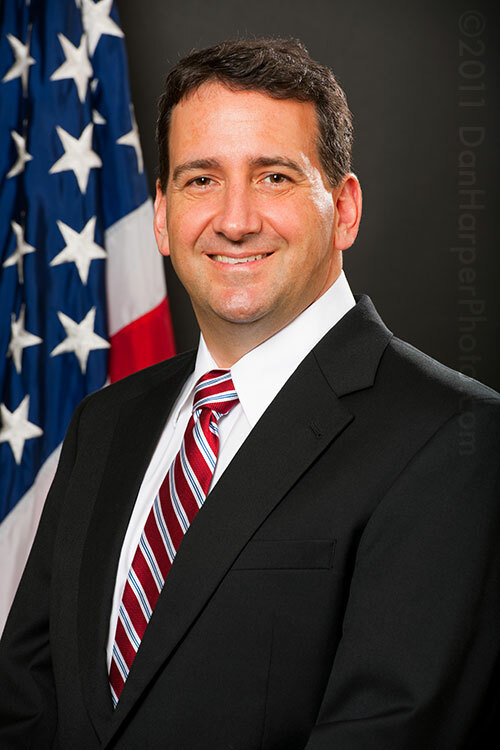 I have just recently done photography for the US Consulate and was extremely happy to be able to provide their Consul with his official photograph. I shoot a lot of interesting things and meet a lot of interesting people. Today was definitely another one of those days while shooting I got to listen to the great back and forth chat with three analysts who are going to be working the election for CBC. 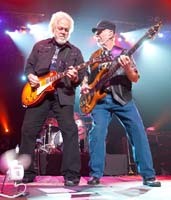 These guys were so good it made me want to watch and listen! 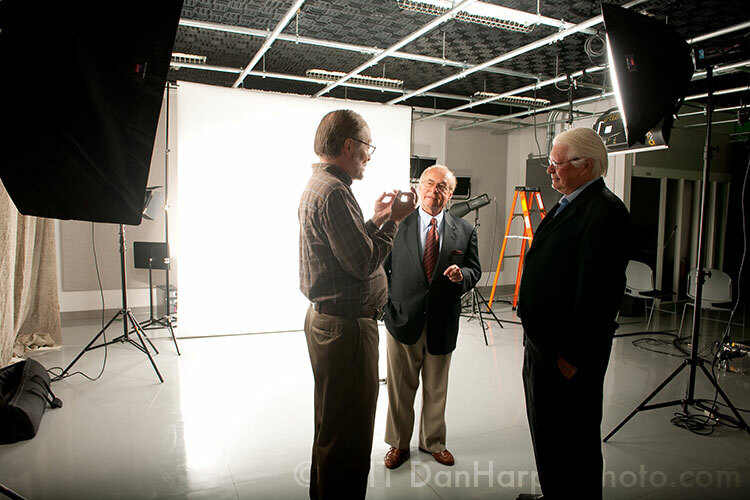 Here's a behind the scenes shot from the studio. Tonight while I was out shooting stock photos at Steep Rock, MB myself and two others spotted a UFO! I had heard stories about something similar being spotted at Steep Rock in years past and after seeing the object for myself I figured out (to all the conspiracy theorist's dismay) that it was simply a Chinese Lantern. A very cool ruse, but unfortunately not a UFO. As official photographer and photography coordinator for events at the MTS Centre, today I offered an opportunity to photographers (through the WPC - Winnipeg Photo Community which I run) to photograph Blink 182 at the MTSC. I chose Dwayne to shoot the event. Thanks Dwayne! Today I spent the day out at Camp Y about 40 minutes North of Winnipeg. The weather was amazing and the kids and staff were even warmer! How can you not like camp?!!! 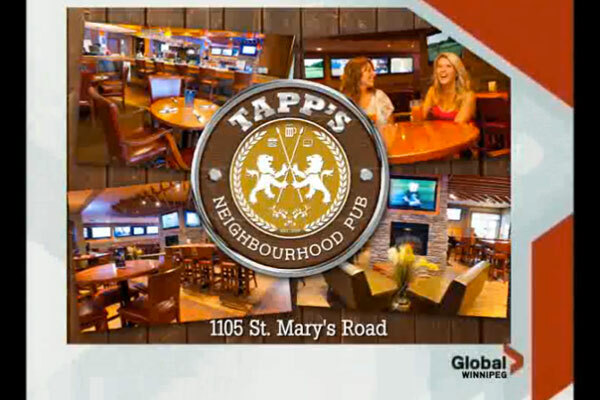 The photos from this session are to appear on a television bumper ad on Global for Tapp's. 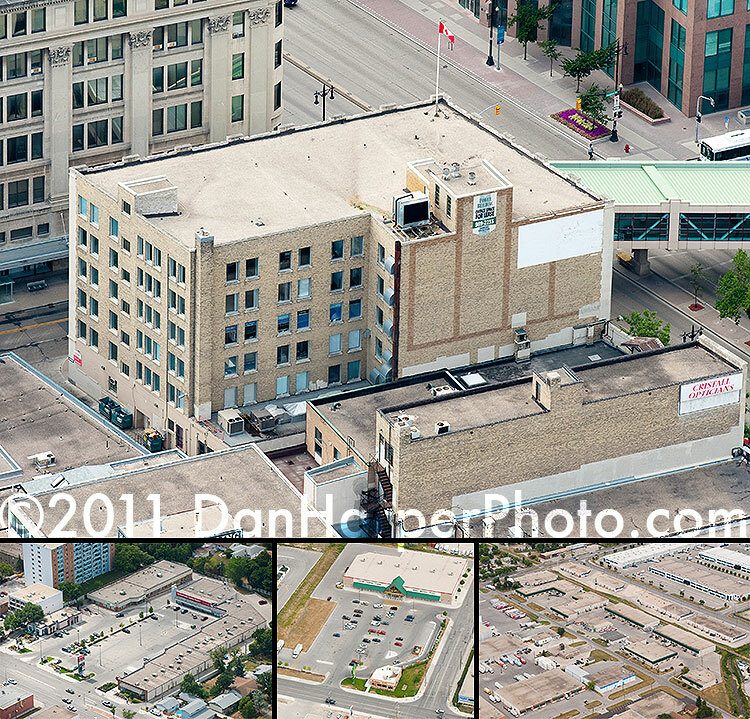 For the last couple of years now I've been chartering helicopters to get updated images for the FNP of their areas downtown and at the Forks. It's always a great ride! I've worked for the NCN for a couple of years now and been up to Nelson House a couple of times but it's also nice when they're in town which makes the trip to see them a lot shorter! I spent two days in Falcon Lake to capture the eco tourism tour offered by Falcon Lake Lodge. It was amazing! Hiking, biking, eating and even biathlon shooting! I do several helicopter charters a year for various clients and am happy to have another new client, Neptune Properties, to get more aerial photography for. Model photography is something I do only when I have time but I was very happy I made time for Karisa! She's amazing to work with and comfotable even outdoors! What's the most people you've photographed in one photo? In this case, I almost outdid my max but even with 120 people in this photo I was still well shy of breaking my own record! Concert/live band photography: Rob Zombie & Slayer! 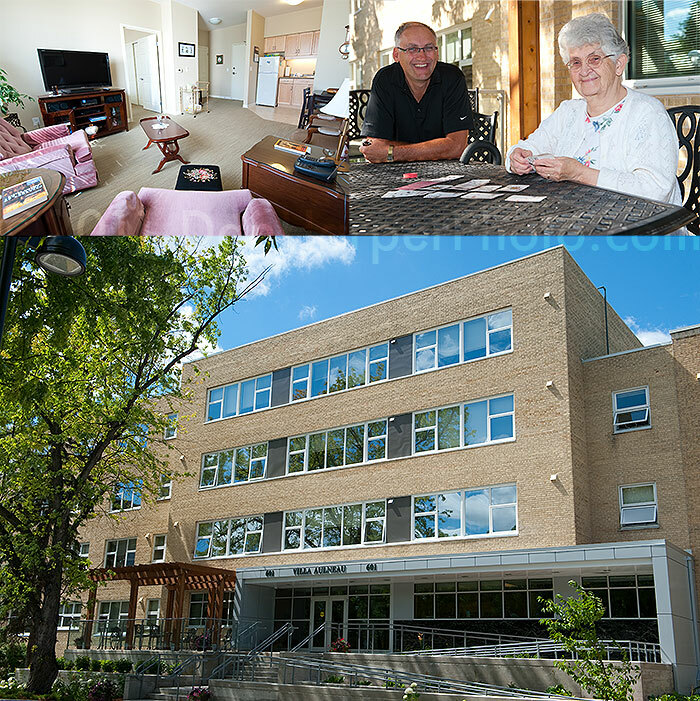 Villa Aulneau, previous (and still) home to the Grey Nuns, is now selling condos and asked me to do photos for them for billboard and other commercial use. After the remaining shoot we needed, the PC reps were nice enough to let me get some photos of the beluga whales which are as abundant as the deer in and around Winnipeg. Thanks Duane! And thanks to all the PC reps from Churchill for making my stay a great one, especially Mike! We had a great day today and I was able to get almost everything we needed from two of the main locations. As the photography coordinator for the MTS Centre, due to my being in Churchill, Manitoba I offered the opportunity to photograph Cirque du Soleil: Dralion to other photographers on the WPC and out of the dozen people who applied I chose Shaun to shoot it for me. Thanks Shaun! Today was rained out so I was asked to stay an extra day. Originally slated to return Thursday night, I had to change my flight plans to Friday night. Unfortunately today was quite cloudy so I was only able to do one portion of the contract which was the visitor centre indoors. As the photography coordinator for the MTS Centre, due to my being in Vancouver I offered the opportunity to photograph Kenny Chesney to other photographers on the WPC and out of the dozen people who applied I chose Dave to shoot it for me. However, Dave had to cancel, but that's ok, I had already planned for that and Bruce ended up shooting it for me. Huge thanks to both Dave and Bruce! As the photography coordinator for the MTS Centre, due to my being in Vancouver I offered the opportunity to photograph Lynard Skynrd to other photographers on the WPC and out of the handful of people who applied I chose Candace to shoot it for me. Thanks Candace! 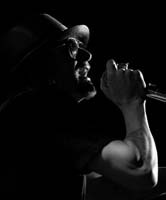 As the photography coordinator for the MTS Centre, due to my being in Vancouver I offered the opportunity to photograph The Tragically Hip to other photographers on the WPC and out of the dozens of people who applied I chose Doug P. to shoot it for me. Thanks Doug! I travelled to BC for ten days to visit Vancouver and spend some quality time at our cottage on the West coast. Oh, did I mention I got engaged! This is a photo of Camille and I on the exact spot I had asked to to marry me just minutes before. Caught some lightning as it stormed around the city . Unfortunately most of the lighting was hidden so I didn't get anything great but that's often what you get when you chase a storm! The FNP are the good people who manage the Forks and NP area & development. 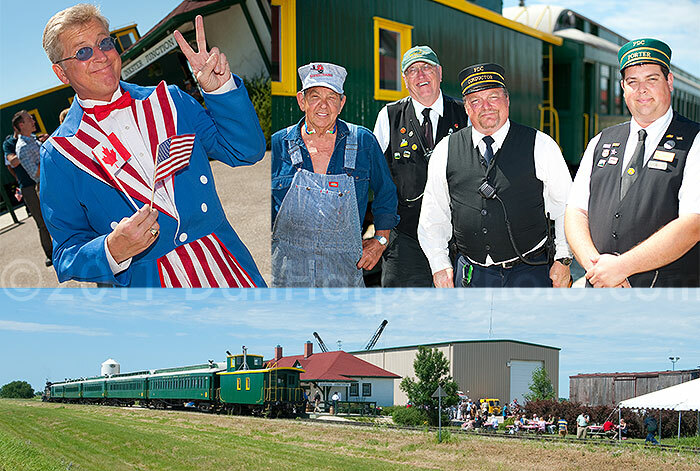 I was out today doing photography for their 1st of July celebrations. You know those events where someone rents a roof and has a party on it? I didn't either, but obviously the people at Ugly Ducking have some amazing event ideas! 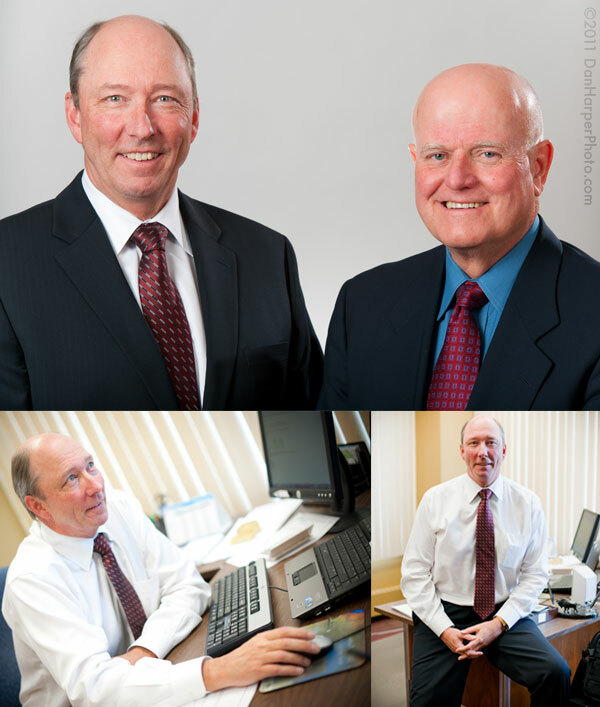 I've had a long relationship with TC and am proud that if lawyers can trust me to take their photos, anyone can! Print sales: Today I sold four large prints to Frieda for her home & for her to take to family back in Europe. As regional director for Marathon-Photos.com who are the official photographers for the MM (and have been for several years) I was in charge of hiring 12 photographers to photograph the event as well as shooting it myself. 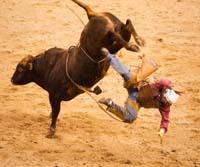 For the last couple of years I've done the official photography for the Red River Ex. Tonight I photographed the most amazing fireworks display I've ever seen which was even better thanks to all the lights at the Ex! Thankfully despite his honor being a very important and influential figure I didn't have to wear the same thing his security detail did: full suits/jackets, because it was extremely hot outside and carrying an extra 25lbs of gear up 5 flights of stairs and all around the CMHR doesn't mix with those kind of temperatures. 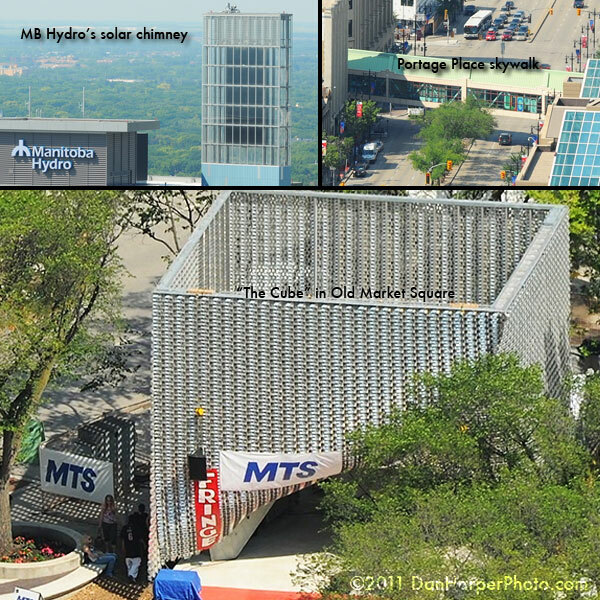 Stock photography: Added to my stock of Winnipeg Legislature images since it was another beautiful Winnipeg day today. 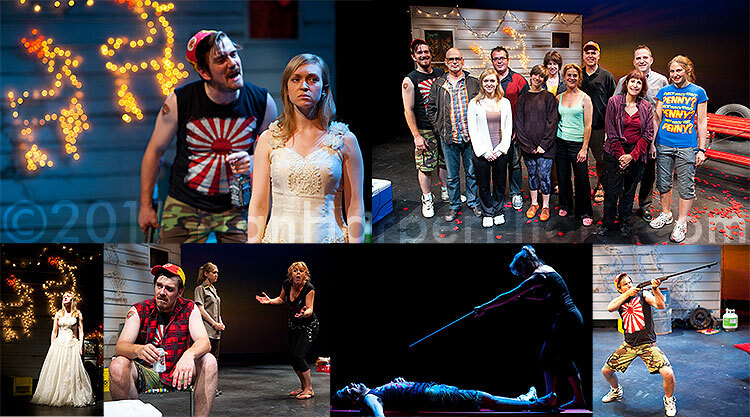 I'm always proud when Mark P gives me a call to shoot his new plays. Not only do I have a great time but I get a better than front row seat to his most recent creative mind explosion that just happens to end up on paper in play format! Another month, another monthly meeting for the WPC! 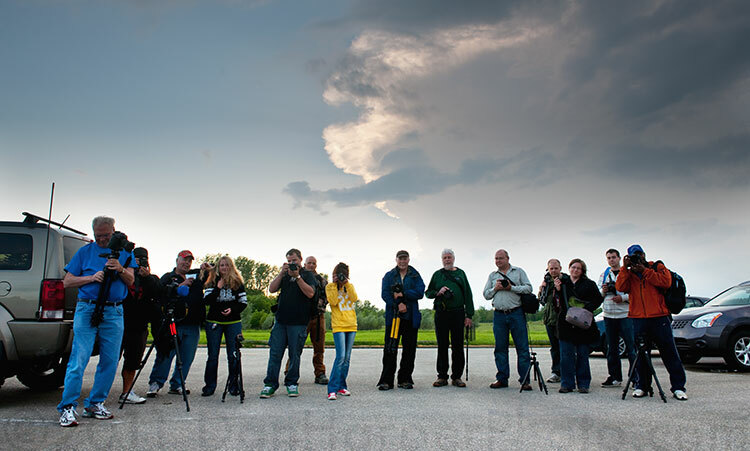 This time a group of about 20 photographers converged on the Birds Hill Park area to photograph the sunset around the park. Thanks to everyone who came out! Can't wait to see everyone's photos! As the regional manager for Marathon-Photos.com I hired 12 photographers for the Manitoba Marathon and today was training day! It takes a lot to shoot a sporting event and since runners don't stand still it takes some extra training to shoot that action as well as to shoot for Marathon-Photos.com. HUGE thanks to all those from the WPC who I hired on to help us this year! Shooting a marathon is a...marathon event shoot, not easy, so I appreciate your major efforts and hope you all had fun! As the photography coordinator for the MTS Centre, due to my being in Whistler to shoot a conference I offered the opportunity to photograph Supertramp to other photographers on the WPC and out of the 5-10 people who applied I chose Bruce B. to shoot it for me. 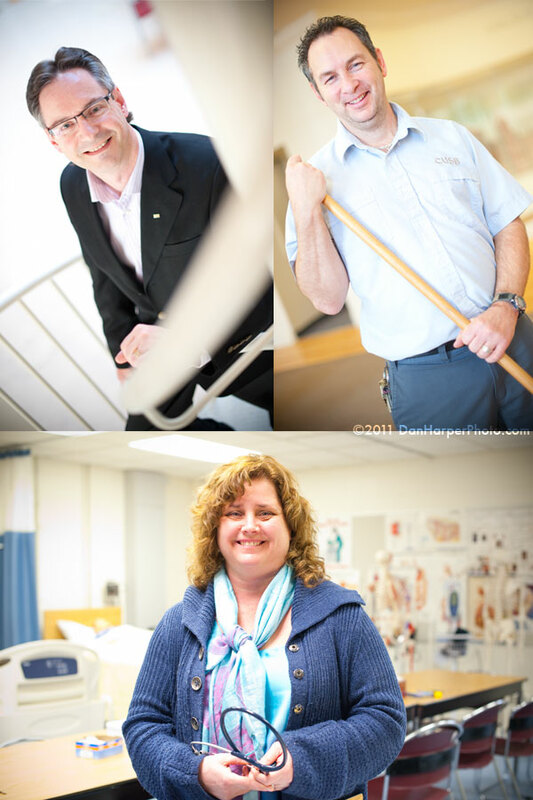 Last year I photographed a national event that was happening here in Winnipeg for the CCHSE (Last year they were called the Canadian College of Health Service Executives). And they liked me so much they are flying me out to Whistler BC in order to shoot their multi day event! Baby portraits of Maélie for my buddies Dan/Dom whose wedding I shot two years back just outside of Montreal. I don't do baby portraits anymore but when one of your best friend asks you to take photos of his little one, you do it! Photo journalistic coverage of the official return of the NHL to Winnipeg. I, like most of the rest of the city, was out at the Forks for the official return of the NHL to Winnipeg. I, like many others, remember going to the games years back. In my case my dad took me to several games and I remember the proud feeling the whole city had back in those days and am extremely happy to have the NHL back! I photographed the U2 media today to get a pre-front row seat! The biggest show that will be here this year and one of the biggest shows ever did NOT disappoint! 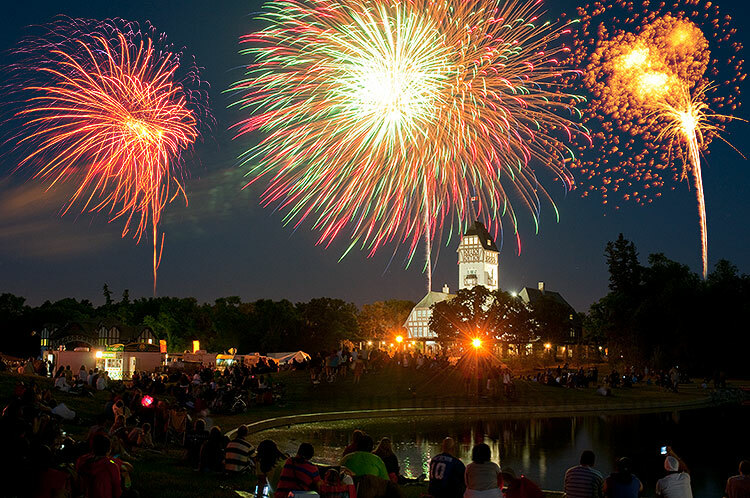 It's the fireworks season again and every chance I get I'll be in and out of town capturing this years displays! A new customer, Darren asked me up to do some product shots for a new product he just developed himself: Foxwalls. 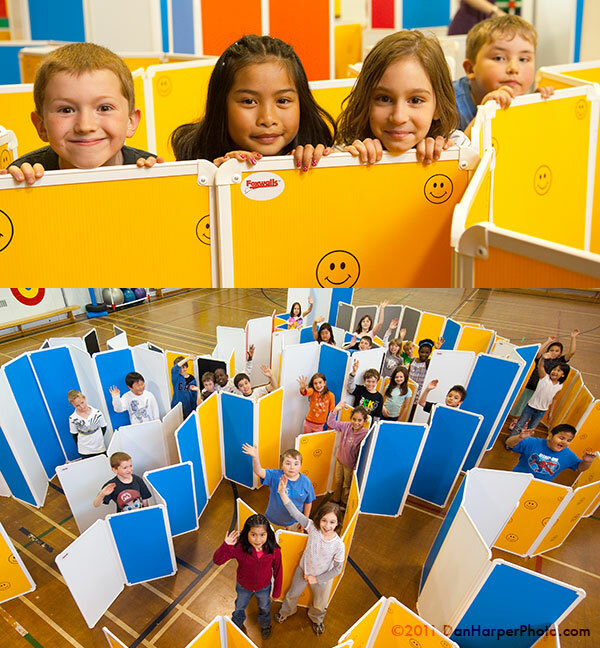 Very fun product I wish they had had when I was a kid, these walls (which he made into a variety of mazes) made every single kid there smile from ear to ear! 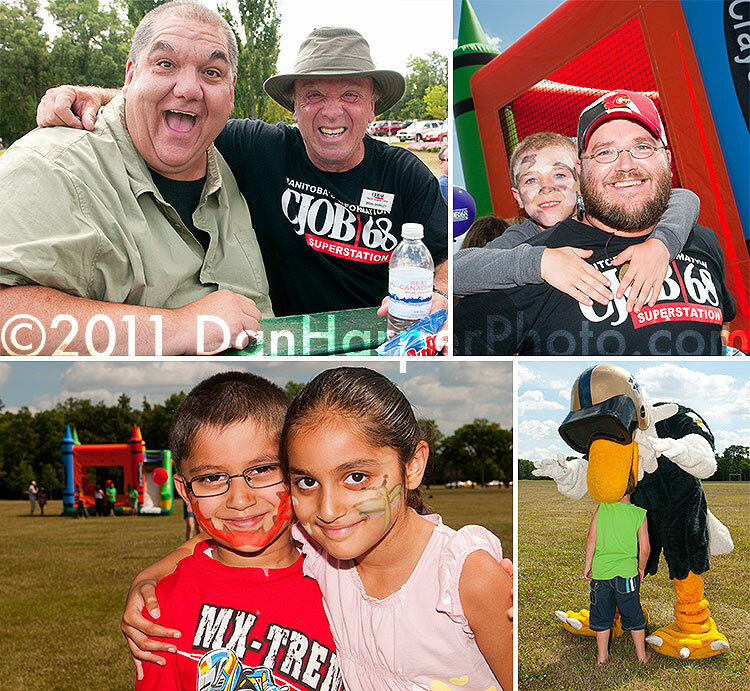 I've done a bunch of work for CJOB/Corus Winnipeg before and always have a belly full of laughs with all the characters! They may self proclaim that they have "faces for radio" but they all have personalities fit for a hit sitcom! 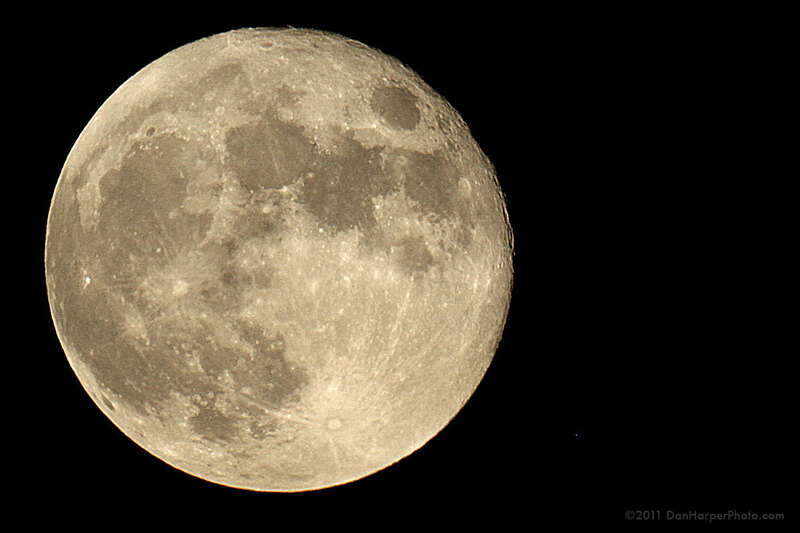 Actually I just got a nice shot of the moon using a small telescope, but even a small telescope is larger than most of the largest camera lenses! I'm starting another collection of planets this year after not doing any in 2010. As part of my being the official photographer for True North and the MTS Centre I get free tickets to all the shows. If you would like to be put in the draw to win either of these tickets you have to correctly answer the following question: What does Dan like to shoot most? and email the answer to dan@danharperphoto.com with whichever tickets you are requesting as well as your first and last name (so they can be left in an envelope for you). As part of my commitment to my photo club The WPC and the advancement of photography in Winnipeg I organized a workshop at the MTS Centre given by fellow photographer Scott Lindstead on his very cool camera trap photography. 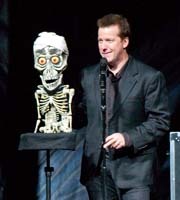 Huge thanks to Scott for the great presentation and thanks to my fellow WPCers for selling out his books at the event! After almost every major concert I shoot I always get several emails asking "how was it?" and "was he/she a nice person?" 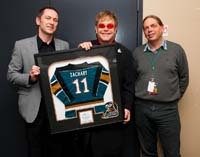 For this concert I was asked to shoot a backstage gift presentation to Sir Elton John. He came in the room, right on time, said hi to the people in question and then started talking about the Vancouver Canucks and hockey in general as it was on one of the TVs in the green room. He then very happily posed for some photos and was then on his way, not hurriedly, not stressed, despite about to play a 3+ hour concert in less than 60 seconds from then. So…what was he like? To me, it was just like talking to your dad after he gets back from vacation. There was a bit of excitement around him from others but he was just an all around nice guy, not full of himself, not concerned about much other than the concert he's about to play. That's the feeling and image I got of him in my very brief time with him. In the case of SEJ I was also asked about his entourage and despite me not directly seeing the people around him when he came in, the hallway was empty, when I left to shoot the concert, the hallway was full. Take from that what you will. And wow did he play the s*** out of that piano! 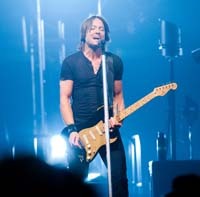 What few people know is that the news photographers and any other accredited photographers only normally get to shoot the first 3 songs from any given concert. There are further stipulations: no use of flash and you're restricted to a specific area, normally the whole front of the stage, sometimes you have to shoot from the sound mixing board area which is several hundred meters from the stage. 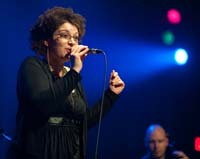 So all the above is my impression from shooting just the first two songs of the concert! Unfortunately photographers were confined to one very specific 5 foot space along the front of the stage so my photos are a bit limited. This is one of those spectacular events to be a part of and to participate in just to see all the all the smiling strong faces! A friend of mine asked me if I would do a model shoot with Briana and despite being overly busy I made the time to do a favor for a friend and happily shot with Briana who towered over me even without heels! As the regional manager for Marathon-Photos.com I was in charge of hiring 5 photographers (and being one myself) for the 2011 Police Half Marathon which we have shot several times over the last few years. Being a long distance runner myself I struggle with either running or shooting these but always get to participate in the fun either way. 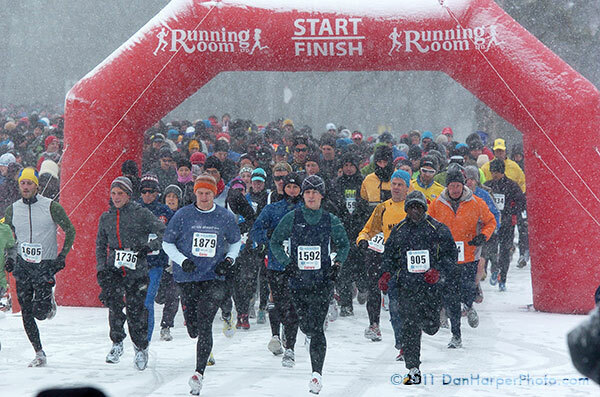 This year we had the added bonus that after several +20C days this race took place during a blizzard that developed and dropped several cm of snow overnight and it became an epic journey just to get to the race! 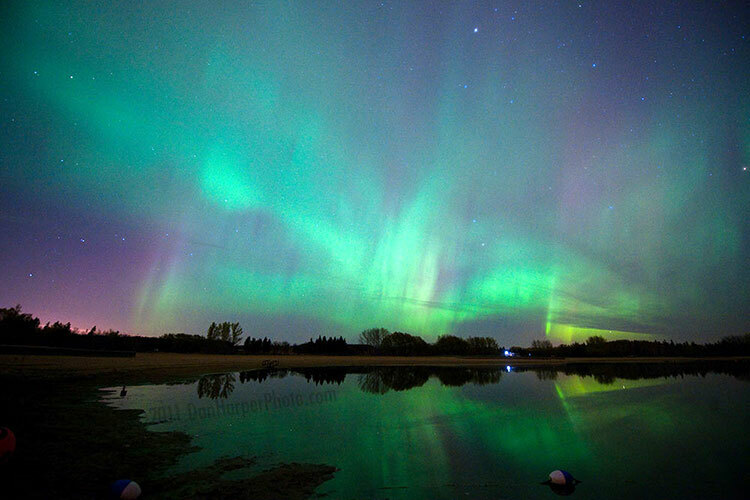 Northern lights/aurora borealis inside Winnipeg! Over the last seven years I have only once seen but never been able to capture the Northern lights within a city. This morning, there was such an active auroral storm that with that and some special technique I was finally able to capture something I've been trying to for years! *Just a note that these photos are NOT Photoshopped. What you see in the photos is exactly what you would have seen if you where there with me! 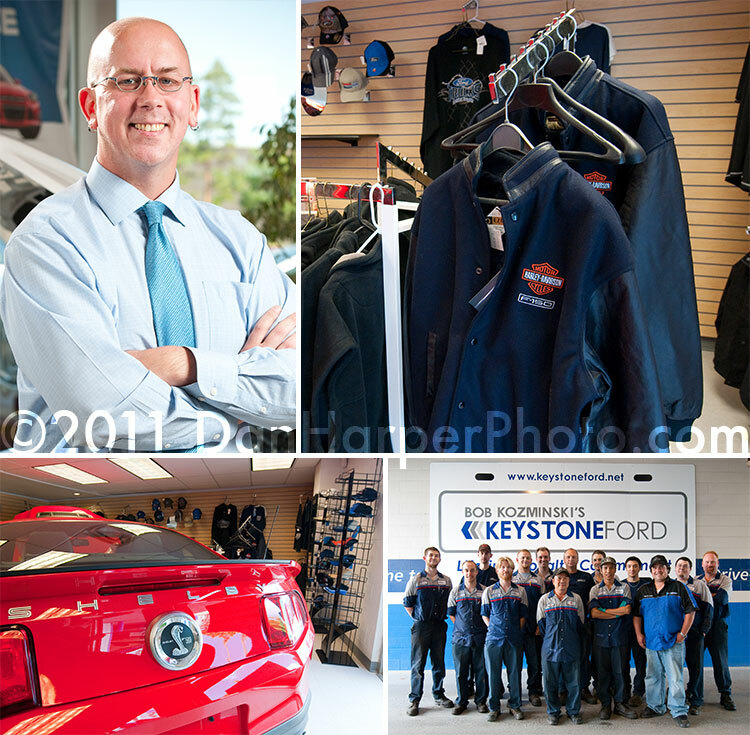 I first took photos for Morrison Hershfield several months ago and in that time they've had to expand which is great news for any company, so, I was honored to be invited back to take all the new employees portraits. What does it take to make the largest group photo I've ever done? The same thing every other shoot needs: pre planning and a camera! 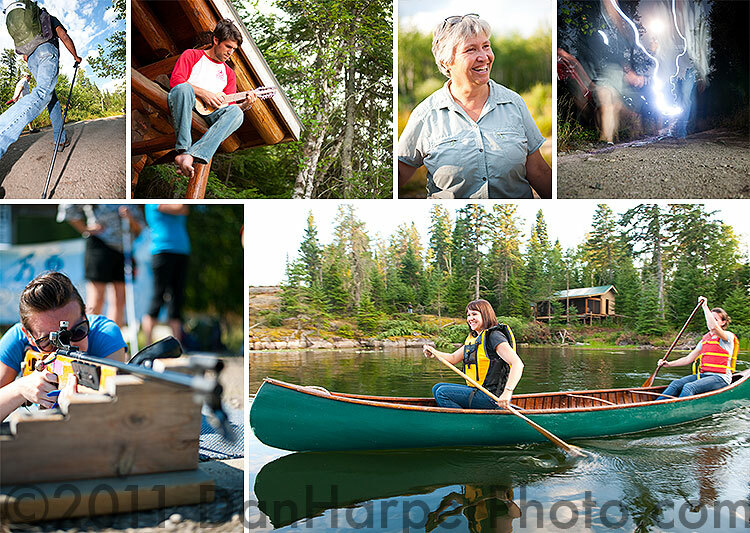 Commercial advertising photography for Parks Canada. 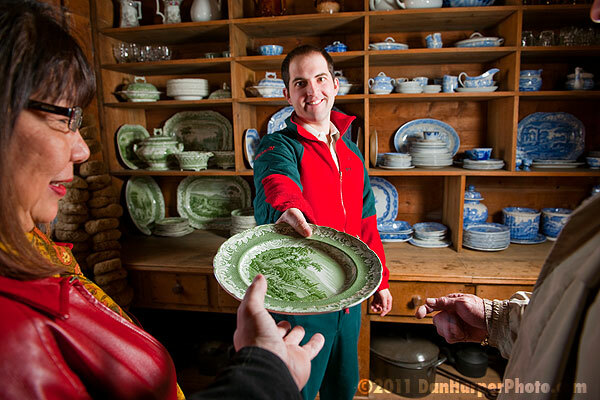 This is one of the shoots that is part of a major contract I received with Parks Canada a year ago. 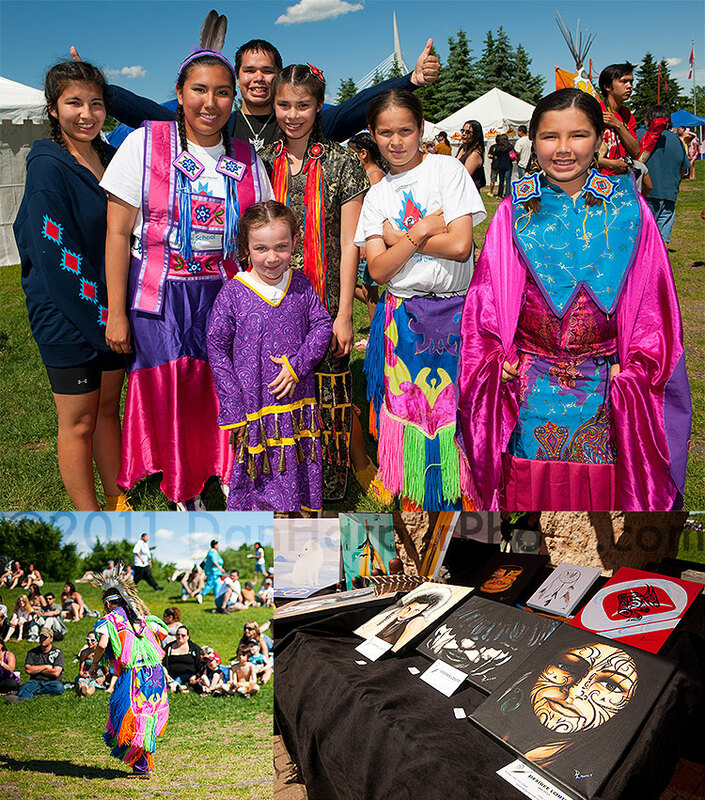 Today I've gone back and unarchived some old summer shots for the Canadian Museum for Human Rights. 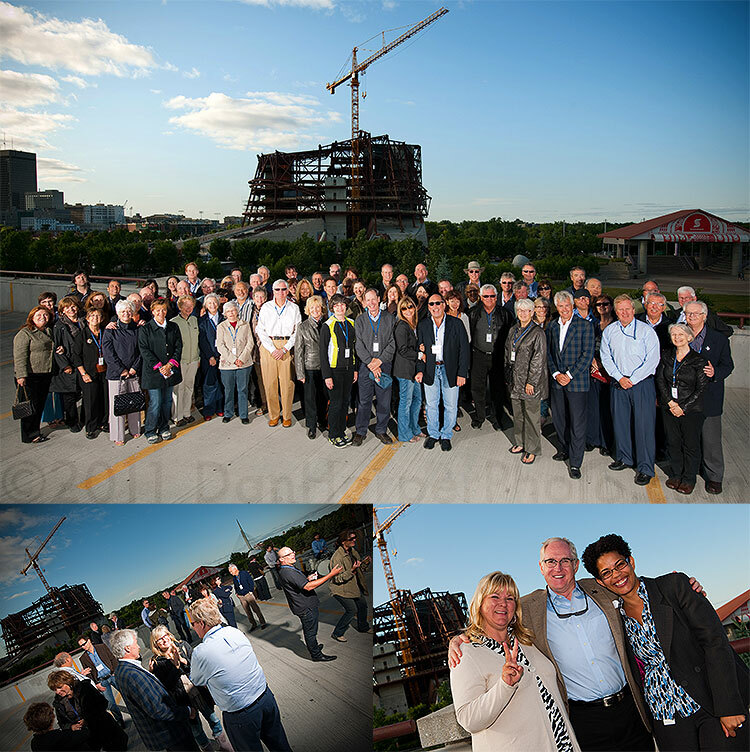 Today was the monthly meeting of the Winnipeg Photo Community of which I am president (but I prefer to call myself the caretaker) We had another great turnout with almost 40 people and as always there where lots of first timers/new members. This was an especially busy event as I hosted a critique session which was very well received by all! 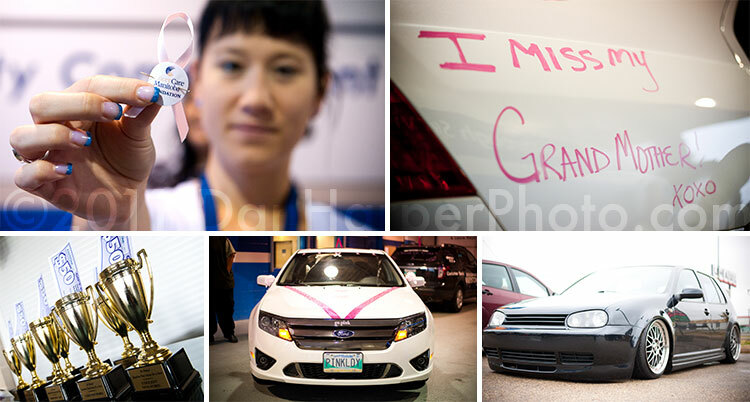 Event photography: Manitoba Opera: 2011 Gala! As the as the photography coordinator/photographer for the MTS Centre today I had Robert L. shoot the Monster Truck event due to another event that I had. Today after a very successful aurora shoot two days ago I went out again to attempt to capture more but unfortunately the lights weren't as active as they where supposed to be and it started to cloud over. That's the life of an auroral shooter! This morning the NL where really active so after filling myself with sugar and my tank with gas I headed out and was lucky t find one of the most powerful NL storms of the last year! Today I did a lighting presentation for the CUSB's photo club which was really fun! 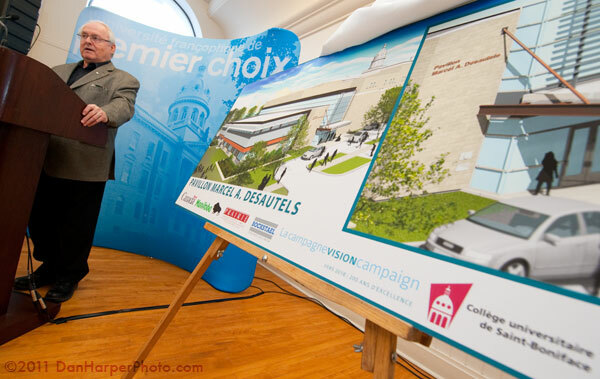 Today I covered a really cool press conference at the IMax for the APC which was an announcement of the new Journey to Churchill exhibit at Assiniboine Park. 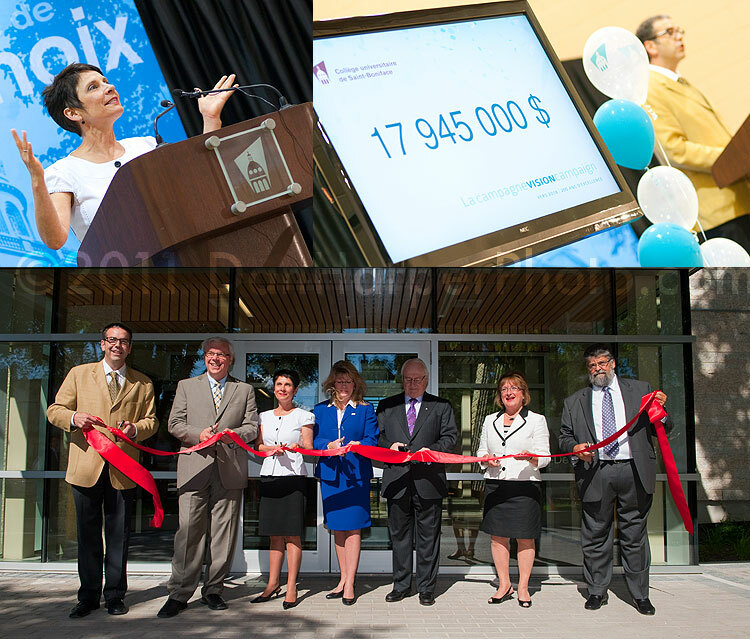 It looks AMAZING and I'm sure it will be a huge thing for Winnipeg! 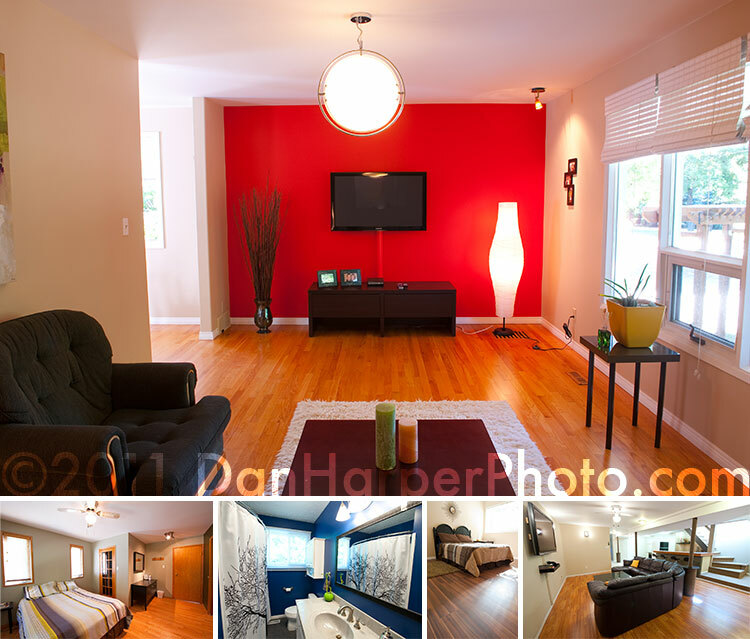 I've done the Winnipeg HSC lottery homes and cottages for the last 3 or 4 years and they're really fun! The only downside is that you have to be in a house which you will never be able to afford and then go back to your own home. Ok it's not actually that bad and even living vicariously for a few hours in someone else's home is fun! 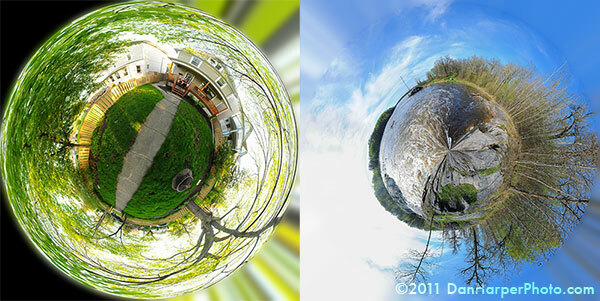 I'm starting to do more and more virtual tours for schools and the real estate community and they're always fun! As the regional manager for TPS/Marathon Photos I was in charge of coordinating four photographers to shoot the Hypo Half. Unfortunately for the last two years I haven't been able to shoot this event myself as I have to cover the closing day of FDV but it's great to be able to hire other enthusiastic photographers to help me out when I need it. Huge thanks to my primary for this event: Doug as well as Shaun, Deb and Veronica! You did a great job all! This will be my third helicopter ride in two weeks! Today is the first of a 10 day photo shoot for the FDV. Shooting FDV is one of the most diverse shoots I'll do all year as it incorporates every style of photography imaginable. 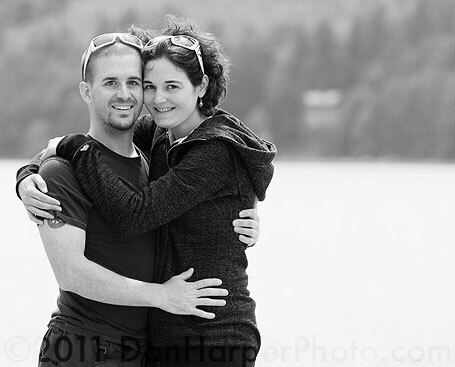 I really like to help others just getting into the photography industry so this year I have two student photographers from the Red River photography full time course shooting for me: Deb and Bobby. 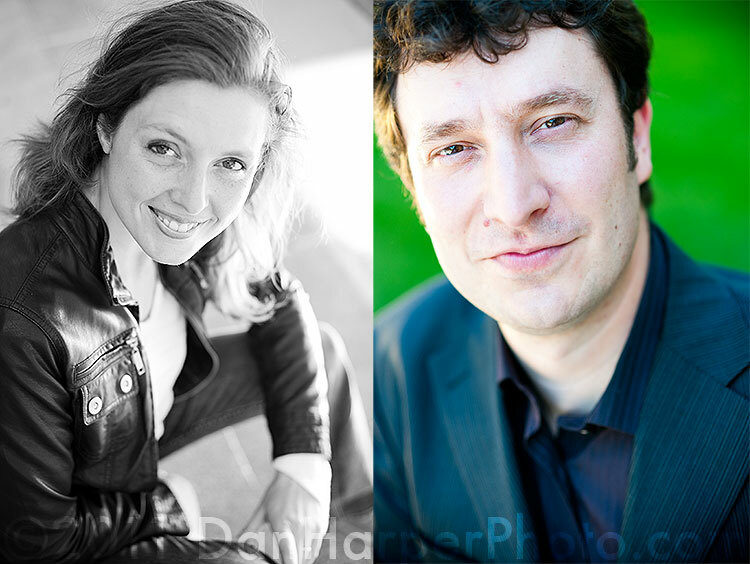 Huge thanks to both of them for helping me out , I hope you enjoy the experience of a coordinated multi-day photo shoot! It's great to be able to shoot any band, but especially when you've enjoyed their tunes for so long. Heart is one of those cases where my dad introduced me to them when I was younger. 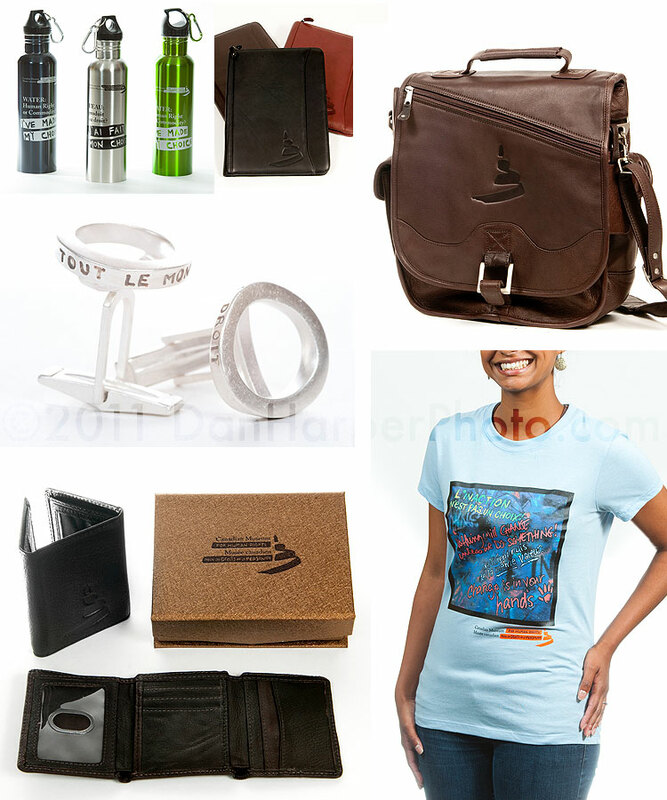 I also had the opportunity to do some candid behind the scenes shots as well as a gift presentation shoot. Today I chartered my first winter helicopter ride. Unfortunately the weather wasn't ideal so I will surely be out again while the white stuff is still around. Today I ran my second "Going pro" seminar, a heavily refined and updated version of my 2010 seminar. This seminar is Winnipeg's only one stop "everything you could want to know about the career of photography " from starting a photography business all the way to how to price your work and time all the way to how to process and send out files. Thanks to all this year's attendees! A DVD of this seminar will be available sometime in March. Three years ago I started concentrating more on the corporate and events side of my photography and decided to stop offering wedding and family portrait photography. Over the last three years I've been almost true to that, taking only very specific weddings such as the three I took in 2009: One in Cuba, one in Montreal and one in Calgary. Last year I took only one wedding, this one for my running partner. However, after trying my best not to take even a single wedding this year, Kris, who was the best man at a wedding I did a couple of years ago, would not take no for an answer citing "You were awesome with Kelly and Sharon and your photos where so great and we thought you where hilarious" who can say no to that? Today we sat down to talk details, one major one of which I suggested being a transparent dock on which they'll be married. Can't wait to see it! 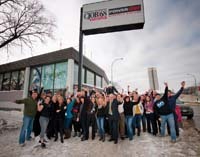 Also today I covered the new building that the Corus Radio network is moving into in Winnipeg. Some of the photos are being used in the Broadcast Dialogue magazine. 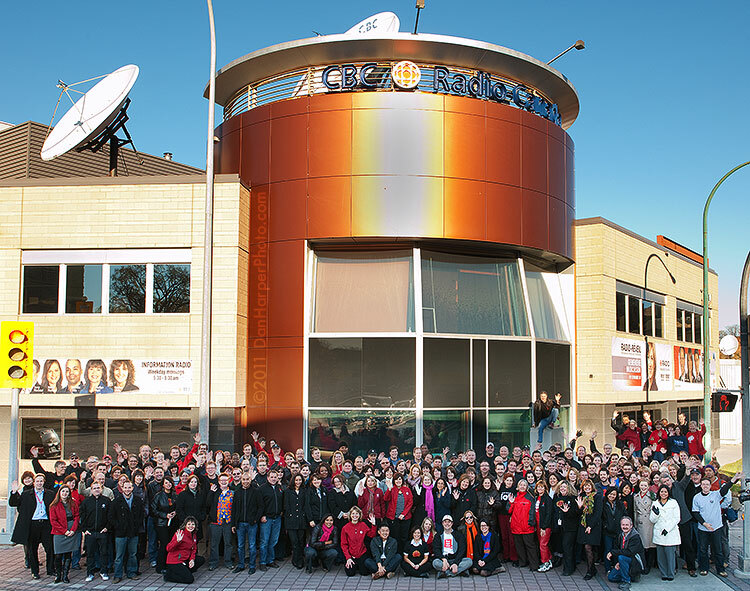 This week ends the end of a 50 year run of the Portage Ave location for CJOB, Power97 and Groove FM. 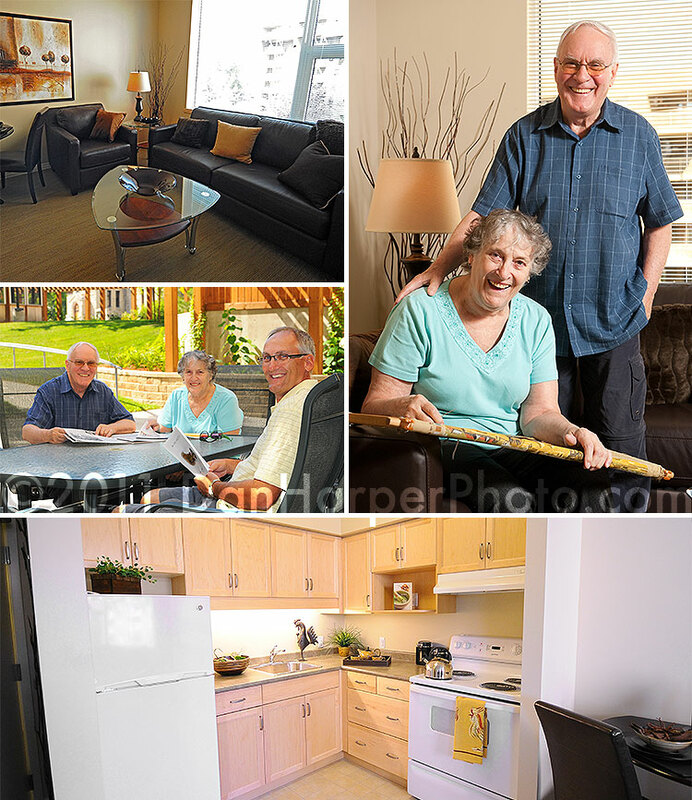 I hung out for part of the day to catch people packing before people moved into the new building by Polo Park on Jack Blick Ave.
Long time client of mine Travel Manitoba asked me to photograph their official photos of new CEO and Chair and in addition to those I got some different more candid shots in order to try something different. Be ready for anything: I'm well known by my clients as someone who can take things into my own hands, work with no supervision even in secured locations and still get photos with a lot of impact, dynamism and especially big smiles! This was a case where I came into the job with only a request to photograph one person, but it ended up that I was asked to shoot another two people while on site and CUSB really appreciated my ability to think on my feet! After the shoot I was given the very kind words that I was: "Creating a new and unique look for the CUSB's photography which many staff members have already commented on often." This is a huge compliment and I hope only to better myself to give the CUSB, my alma matter, the best photography possible! In this industry as many others there are factors that are simply out of the photographer's control and you just have to roll with the situation as it comes. This event shoot for Manitoba Hydro was one of those cases where I arrived on site at the very cool new Hydro building, my first time there, and then set up my gear, got everything ready and then I was told that the shoot had to be cancelled due to several people not being ready/available. Thankfully I was still able to stick around for a few minutes and get some shots from the highest boardroom in the building, very cool! I remember years ago when I was about 6 years old when my mom took myself and my sister to the Assiniboine Park to put our hands in this muddy stuff. Little did I know that even now, well over 25 years later those hand prints are still at the Zoo, part of a large wall of hands! This is another one of those very cool opportunities for Winnipeggers to participate in something that will leave a legacy for themselves. Time for me to "buy a brick"! Just a reminder for anyone interested that this is the final week to sign up for my Going Pro 2 seminar under the early bird pricing. Check it out and register right away here. Today the warming hut architects, engineers and workers started their new warming hut projects at the Forks. These are spectacular international architectural creations from as far as Israel. 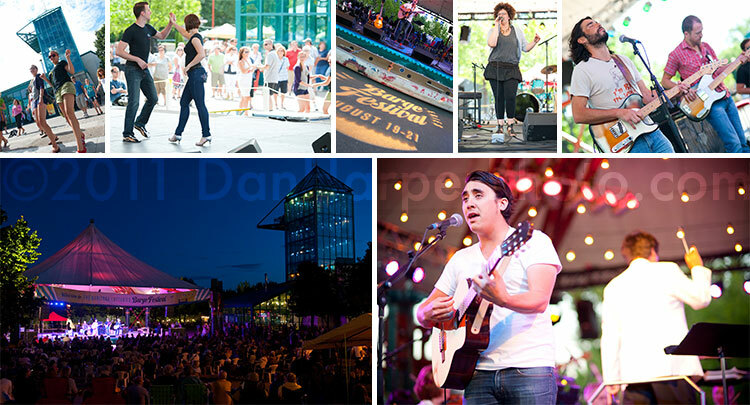 If you're around the Forks, they're definitely worth a visit! 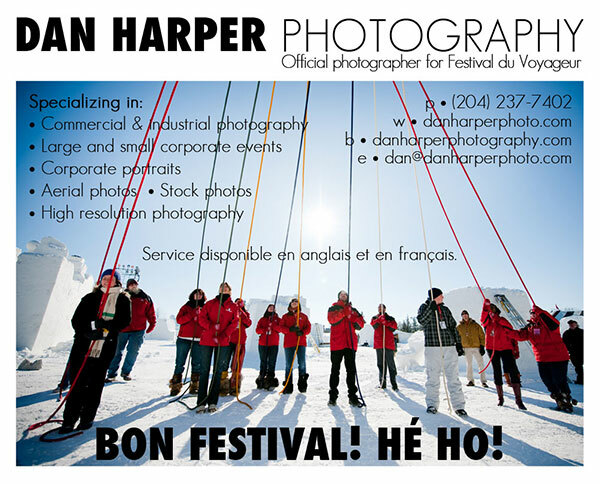 As part of my deal as the official photographer for Festival du Voyageur I get an ad in the festival guide and the above is the half page ad that I created for it. Look for the guide in your newspaper as well as in stores all around the city. Smith Carter Architects and Engineers requested one of my photos to include with an awards submission. 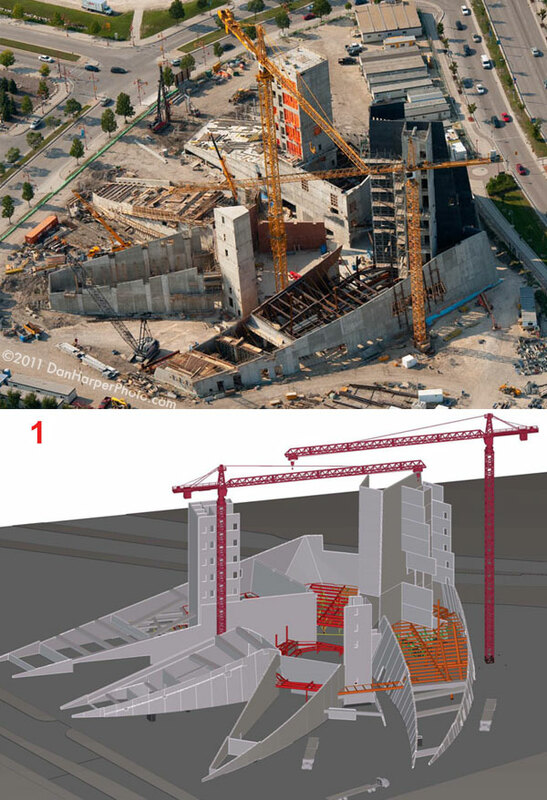 The photo is from a very similar angle to one of their renderings seen below with my helicopter photo. Huge thanks to Lee for his coordination on this collaboration! I finally had time to go through my new years ever fireworks at the Forks, and here they are. 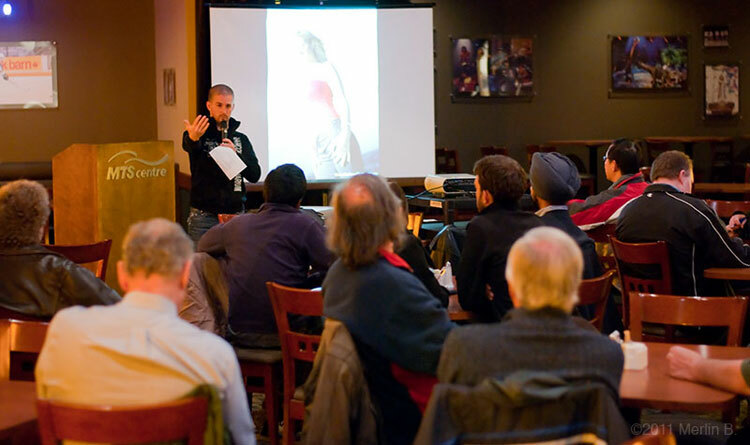 Tonight I hosted another monthly meeting for my local photo community the WPC. This time in a slightly new location! Huge thanks to Ted for the hookup on this one! 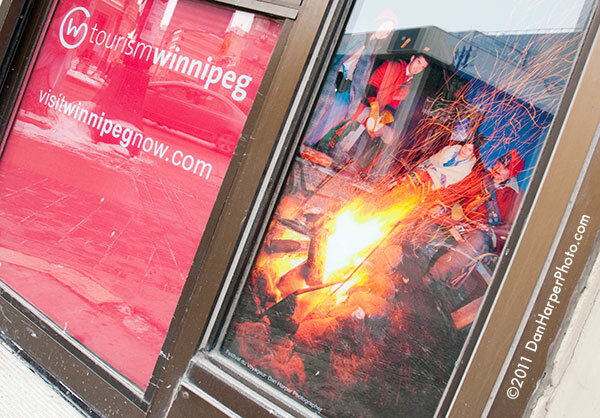 Random image spotting: Today I was walking around town when I spotted one of my images on the Tourism Winnipeg building. 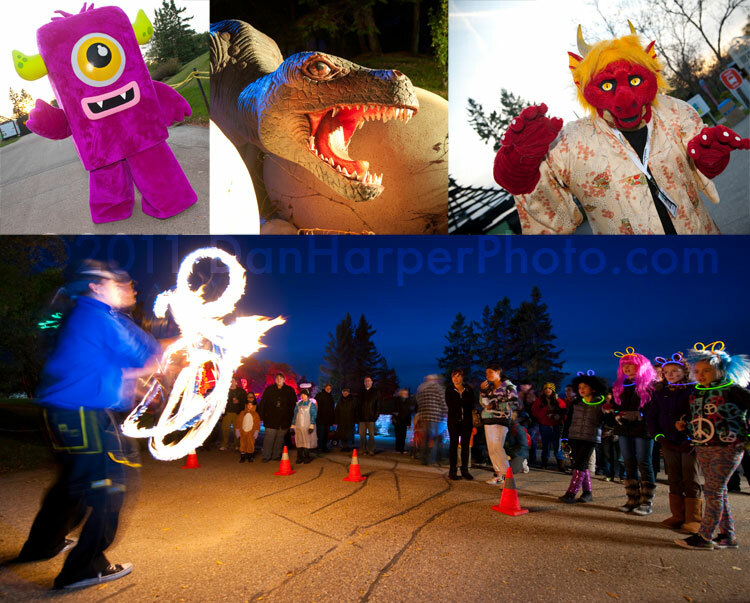 There was also another image by a photographer I hired to shoot an event for me during Festival du Voyageur, both in the same area. So, how exactly do you display a 5167 megapixel photo that is too large to print and over 15 gigabytes in size? 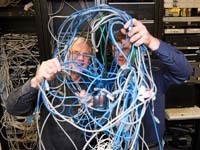 You start by upgrading your Internet service package in order to get an upload speed fast enough to upload a file of that size (without leaving your computer on for a week). Then finally after about 5 hours of uploading you have what I believe is be the largest image ever taken of Winnipeg, uploaded to the Internets for all to see and explore! Can you find the following along with Waldo and other cool stuff?! 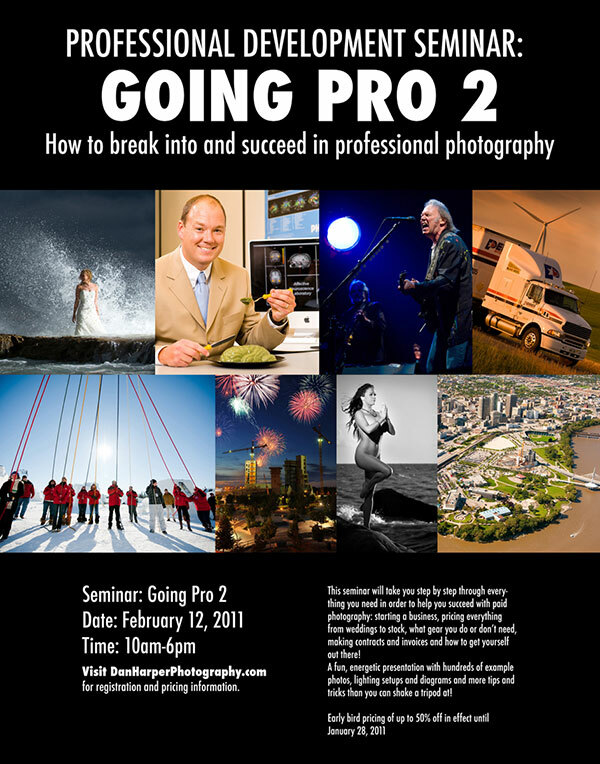 After well over six years as a full time photographer I've learned SO much and want to share so have created the "Going Pro 2" seminar. I put this on last year and got amazing compliments on it, one of the major ones being "I can't believe you where so open to share all your knowledge". I've taken the comments from last year and vastly improved this year's version. This is a no holds barred seminar where I talk about EVERYTHING photography from how to start your business, make forms, contracts and model release forms, how to price every kind of photography (weddings, stock, product, portraits etc) all the way to how to get long term clients and create a web site. Gilles is a great guy I met shooting a wedding in Montreal last year. He was the best man for a friend of mine and needed some shots taken for his new web site. I was happy to oblige just having moved into a new home myself. 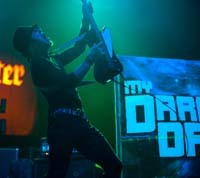 Dan Harper: Italian hero? Um...what? I guess they really like fisheyes in Italy! My 2011 resolution: I'm going to immediately do all those things I normally put off until later...wait, maybe I'll put this off till next year.